Maslow’s hierarchy of needs is basically a theory that aims to understand what motivates people, represented as a pyramid that maps the different levels of needs. At the lowest level are the basic human needs that are required to function. As those needs are met, individuals move up the hierarchy to fulfill deeper and more complex needs. The other day, in my organizational development class, we discussed the hierarchy and how it applies to all different contexts. I thought it would be interesting to understand how different threat actors’ motivations mapped to the model. As I started to map them out, I found that it was pretty easy to do – the key is simply to figure out what drives each form of attack. At the most basic level you have critical infrastructure attacks, where the motivation would be to deny the victims access to electricity, water, and other public infrastructure. As you move up the pyramid the attacks are aimed at safety needs; hacking traffic systems to disrupt public safety or committing insider fraud for monetary needs. The next level up is psychological needs. These needs are driven by a desire for love, belonging and esteem. Attacks that fit into this category would be cyber stalking, cyber bullying and hacktivists committing attacks driven by their beliefs. 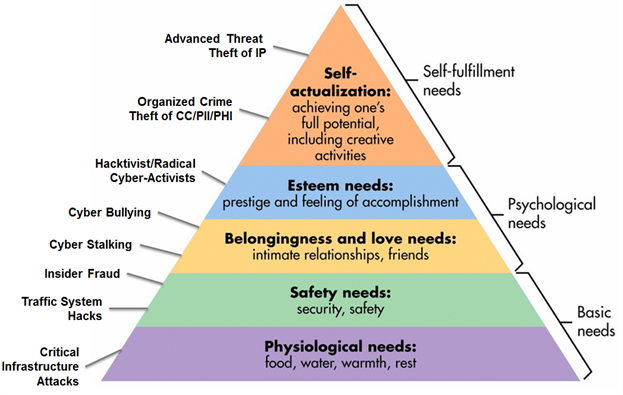 At the top of the pyramid are self-fulfillment needs, where the attacker recognizes their full potential. These are the most sophisticated types of attacks where hackers leverage their talents as a business. They work as contractors and subcontractors or even go on their own and hack organizations to better their life and well-being. In short it is their career just like the careers each of us have. We strive for new tips, tricks, and even challenges or methods to operate more effectively. The attacks they perform are at the highest challenge level and are focused on taking IP and information organizations use as competitive advantages or to progress their business and other initiatives. Understanding an attacker’s motive gives your organization insight into what they are after. And the more you understand what drives them, the more effective your security strategy will be. Please share your thoughts in the comments section below.